We have a constant flow of aircraft running through our shop. We will always clearly indicate to customers the level of work performed and process followed. Obviously, prices vary according to the work done. Please read below about the different work processes. Please have a look in our Aircraft For Sale page to see what is now available. During the 1940s and 50s thousands of Stearmans were converted to crop spraying and dusting service by the installation of hoppers in the front passenger compartment. In the 1970, 80s and 90s, many of these were restored back to their original configuration. In fact it is estimated that over 90% of the Stearmans currently flying were former crop spraying aircraft. A great many of these aircraft have been well maintained after a thorough restoration, but after 15 to 25 years are now starting to show their age again. These aircraft were completely rebuilt to a high standard; often with all new wood, a lifetime Ceconite fabric, and many new parts. In general, these are wonderful and reliable aircraft, with low to mid-time engines, but after many years in service, they don't look quite as stunning as they once did. They don’t need a full restoration - they need a VintageAero Rejuvenation! Why? Because the aircraft that we select for rejuvenation were high quality restorations. They don’t need new wood in the wings or a new fabric covering. The engine and propeller have low hours since a major overhaul. What the airplane does need is some tender loving care and a very thorough going through from the ground up by a well-trained eye. The result is an aircraft that will look and fly like a brand new restoration, but at a much more affordable price. Rejuvenation is an FAA accepted process (AC43.13-1b(2-35)) that is used to restore flexibility and significantly extend the life of doped fabric finishes on aircraft. The great thing about modern synthetic fabric coverings like Ceconite® and Stits PolyFiber® is that they can literally last a lifetime - much longer than the dopes and the polyurethane paints that are used to finish the fabric. While polyurethanes will usually crack after only a few years, a properly applied dope or PolyTone® finish can remain flexible and durable almost indefinitely - provided that it is periodically rejuvenated. According to the FAA, rejuvenator consists of a "mixture of very potent solvents and plasticizers to restore [dope's] resilience." Since each aircraft that we purchase is unique, each one requires a different scope and depth of work to bring it up to our final standards. Therefore the first step taken is always an in-depth evaluation of the aircraft condition and potential, followed by a work plan that will vary from a basic rejuvenation to a full airframe overhaul. We performa detailed inspection and evaluation of the aircraft. Of all the aircraft that we have assessed for purchase, only about 10% meet our high standard for candidates of rejuvenation or restoration. We completely disassemble all components (wings, empennage, centre section, flight controls, etc.) and remove all panels and covers. This gives good access to the individual components and allows us to work with them inside our climate controlled spray booth. All doped surfaces are sanded and all cracks are removed down to the base fabric nitrate layer. The sanded fabric is then sprayed with three coats of Butysolv or PolyTone rejuvenator (as appropriate). Sanded layers of silver dope are then applied for fill and fabric protection. Finally, several coats of Randolph butyrate or Stits Polytone (as appropriate) can be applied for final colour and gloss finish. In the case of severely brittle or cracked dope finish, the dope is completely removed down to the nitrate layer and the component is refinished from scratch in all new dope per STC. Regardless, the result is a finish that looks as good as new, because it is new! applied after the part has been airworthiness checked by an FAA Inspector. Prior to assembly, leather patches are glued to the correct fabric attachment locations, per factory drawings, resulting in a highly detailed original finish. At the customer's request, the doped surfaces can be buffed to a high lustre, similar to a wet-look gloss of many polyurethane paints - but in a much easier to maintain, and repair form that is less prone to cracking in operation. All inspected components are then re-assembled to the airframe, balanced and checked. Any bad bearings or cables are replaced, and only the correct hardware is used. All cables are correctly tensioned and all control runs, engine, aileron, elevator, rudder and brake are inspected for condition and proper rigging. Brakes cylinders are drained and the fluid replaced. Brake pads are replaced and master cylinders overhauled. The aircraft is then rigged in accordance with the Boeing Erection and Maintenance manual and all brace wires (flying, landing, tail) are correctly tensioned using calibrated equipment. Finally, the aircraft is flight-tested and any discrepancies rectified. A thorough annual airworthiness inspection is performed that addresses all the points in our 106 point certification checklist. Transponder and ELT checks are performed and logged. Any discrepancies are rectified and an FAA Inspector certifies the aircraft. to components: fuselage, horizontal, elevators, wings, center section, vertical and rudder. All sheet metal parts are 100% stripped of old paint, alodyne treated, primed in epoxy primer, and then re-sprayed in an STC compliant, flexible polyurethane finish, such as RanThane. Panels and instruments are removed. The panels are disassembled and stripped of paint. Then they are treated and repainted per "metal parts" above and finished in a non-reflective epoxy coating. New placards and labels are installed. Any defective instruments are replaced. pedals and hangars, brake components, etc. are removed, stripped and painted. Throttle quadrants are removed, overhauled and certified in our shop. If installed, the control lock is rigged for proper function. Remove all fabric from all components. Inspect, replace/repair as needed, and prep/prime all steel and aluminum parts. We re-varnish all wood. Strip fuselage down to bare frame. Inspect, repair as needed and coat inside of frame in hot linseed oil. Clean, prep and paint fuselage, birdcage, fixtures and all clamps. Inspect and replace all bearings as necessary. Inspect and replace all cables as necessary. Disassemble, repair and rebuild landing gear with all new seals. 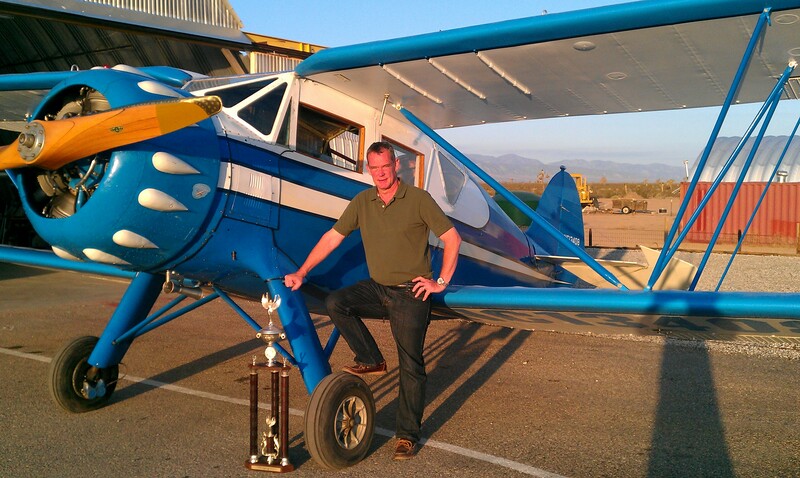 Disassemble, repair and rebuild tailwheel housing with all new seals and bearings. Recover all components in Ceconite or PolyFiber fabric. Finish in authentic Randolph Dope or PolyTone finish. Polyurethane finish (AirTech Systems) available on request. Strip all sheet metal panels of all paint. Etch treat, Alodyne and prime all metal panels. Finish paint panels in polyurethane. Apply original stencils and markings as appropriate. Remove and refurbish or replace instrument panels and instruments. Remove and refurbish cockpit fixtures (seats, controls, avionics, etc). Avionics and electrical upgrade as needed. Application of correct markings, leather patches, stencils and inspection stamps. Hand rubbing and waxing the finish to a lasting gloss. Reassembly using the correct hardware and a complete re-rigging of the aircraft per Boeing Specifications. Instructions and make entry in logs indicating zero hours since airframe overhaul. Detailed 106 item final certification check with new Annual Inspection.